Well, this has been an interesting day to say the least. Since the media, Twitter, and Facebook world have spread this of Secretary Clinton and me, I thought that it would be important to share my experience and why I was there today. I care deeply about tackling climate change and I’m deeply concerned about the state of our democracy. I work for Greenpeace USA as a democracy organizer. I do not work for and am in no way affiliated with the Sanders campaign, as Clinton seemed to suggest in her response. 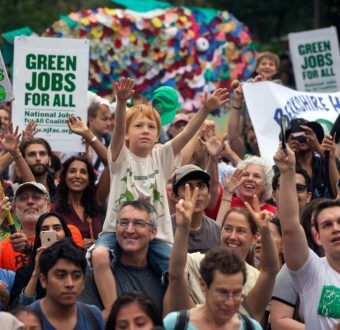 Greenpeace USA, along with 20 other organizations, launched the pledge to #FixDemocracy, asking all presidential candidates to reject future fossil fuel contributions, champion campaign finance reform, and defend the right to vote for all. When we launched the campaign, Sanders signed the pledge immediately. Hillary’s campaign responded, but did not sign. Unsurprisingly, the Republican presidential candidates who won’t even admit that climate change is real — while real communities on the frontlines are already impacted — did not respond to our request. While we appreciated Hillary’s response, the first step a candidate can take to stop fossil fuels is to stop taking fossil fuel money. That money matters when we hear great things about climate in Clinton’s speeches, but want to be sure she’ll truly listen to the people when she is in office. For instance, she supports a Department of Justice investigation of ExxonMobil and yet she takes money from an Exxon lobbyist. That level of coziness makes voters like me who care about climate change uncomfortable. To prove to people that she’s really serious about keeping fossil fuels in the ground, she needs to stop taking that money today. The Greenpeace A.E. 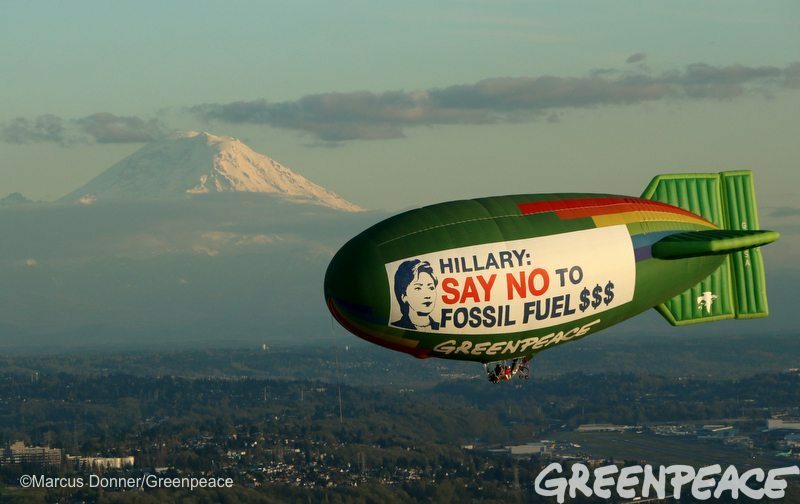 Bates thermal airship flies over Seattle, Washington on March 25, 2016, urging Hillary Clinton to reject fossil fuel money in her campaign. Photo by Marcus Donner / Greenpeace. Today, I said to Hillary, “Thank you for tackling climate change. Will you act on your words and reject future fossil fuel money in your campaign?” I was genuinely shocked by her response. But I want to make sure we are focused on the issue at hand: asking our candidates to take a stand to fix our democracy. Rejecting fossil fuel money sends a strong signal. Greenpeace, 350 Action, and dozens of concerned activists have been attending events, rallies, debates, and fundraisers for many months asking Hillary Clinton to reject fossil fuel money in her campaign. This is by no means the first time that we asked her the question. In fact, last night, more than 40 activists gathered outside of a Clinton Fundraiser at the Dakota, asking Senator Clinton to come out and talk to the people she is fighting for. She did not cross the street to talk to us. To be clear, we are talking about more than just individual contributions from oil and gas employees. 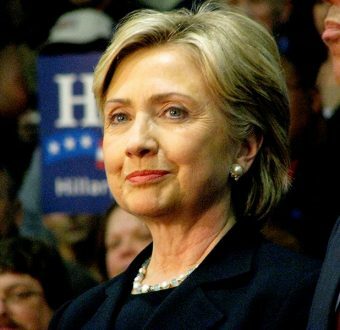 According to data compiled by Greenpeace’s research department, Secretary Clinton’s campaign and the Super PAC supporting her have received more than $4.5 million from the fossil fuel industry during the 2016 election cycle. Eleven registered oil and gas industry lobbyists have bundled more than 1 million dollars to her campaign. If she takes the pledge, she’ll be sending a strong signal to our country and fossil fuel companies that it’s time to keep it in the ground, not just for the future of our planet, but for people that are living on it. 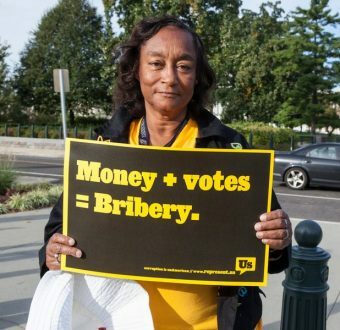 On April 18 in Washington DC, thousands of activists from groups like Public Citizen, the NAACP and Communications Workers of America will take action as part of a Democracy Awakening, calling on our leaders to get the big money out of politics, restore voting rights, and start building a strong and healthy democracy. I’ll be there and I hope you’ll be standing beside me so that candidates like Hillary Clinton can’t ignore us any longer. I hope that this video starts an important dialogue on the national scale about fixing our democracy and taking a stand against corporate interests like the fossil fuel industry, so we can run a democracy that is beholden to the people, not campaign contributions. 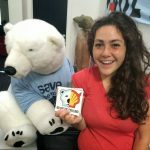 Eva is an organizer with Greenpeace USA's democracy campaign, working to get fossil fuel money out of politics and restore the right to vote. This list tracks funding to 2016 presidential campaigns from individuals working in the coal, oil and gas industries.